Traveling to Montreux on Lac Léman in Switzerland is easy by car, train, boat or plane via Geneva or Zurich airport. Getting to Montreux in Switzerland is easy by car, train, or boat. Montreux is on the far northeastern shore of Lake Geneva with good rail and road connections to other parts of Switzerland, France, and Italy. The closest airport to Montreux is Geneva Airport (GVA) but flying via Zurich Airport (ZRH) is also easy, as rail connections are both fast and frequent. Taxi2Airport and Suntransfers give easy online quotations without requiring flight details and private information. Traveling by car to Montreux is easy from most parts of Switzerland. Montreux can be reached from the Autoroute A12 exit Montreux or from the southeast exit Villeneuve, which is also convenient for traveling to Chateau de Chillon Castle. From Geneva, follow the Autoroute A1 to Lausanne, and then the A12 to Montreux. 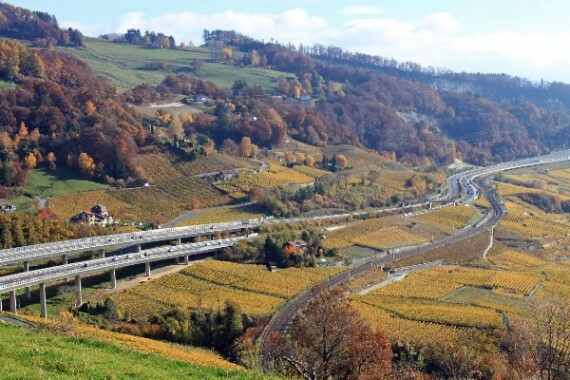 Travelers from Basel, Zurich, and Germany should take the Autobahn A12 from Bern and drive this beautifully located highway via Fribourg to Montreux, Lavaux, and the eastern Lac Léman region. The lakeside road near and through Montreux is often dog slow – not only during daily rush hours but also on sunny Sunday afternoons. Parking in Montreux can be problematic – it is often best to head straight for one of the underground parking garages. During major events such as the Montreux Marché de Noël and the Montreux Jazz Festival, it is often necessary to park in one of the nearby small towns (clearly signposted) and use the shuttle buses to Montreux. Using the train to major festivals and event in Montreux is usually the better option. Geneva Airport (GVA) is the closest airport to Montreux and the most logical choice for travelers arriving by air. From Geneva Airport to Montreux is around an hour by either car or very frequent trains. Taxi2Airport gives online quotations without requiring flight details and private information. Zurich Airport (ZRH) is also a good choice for travelers heading to Montreux. From here to Montreux is around two hours by car or three hours by train. Either way is often faster and cheaper than having to use a connecting flight via Geneva. Montreux has good railway connections to the rest of Switzerland and also surprisingly short traveling times to several European cities including Paris and Milan. 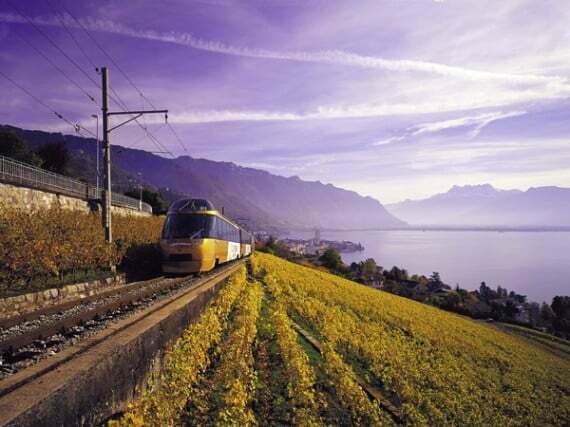 Direct trains are available to Montreux from Geneva, Lausanne, towns in the Rhone Valley, and Milano. For travelers from other cities, it is usually necessary to change trains in Lausanne. See Swiss Railways for online timetables and tickets – buy tickets before boarding trains. Montreux is on the mainline train service from Geneva Airport via Genève-Cornavin station and Lausanne to the Rhone Valley towns including Sion, Brig, and Visp. 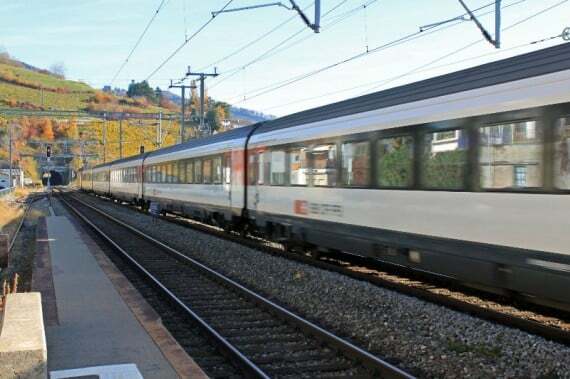 Generally, around four trains per hour are available from Geneva – two direct – taking around an hour from Geneva-Cornavin to Montreux. Trains from Lausanne take around 20 minutes for regular mainline trains or 30 minutes (S-Bahn S1 or S3) – around 4 trains are available per hour. From other major cities in Switzerland, two train connections per hour are usually available for travel to Montreux. 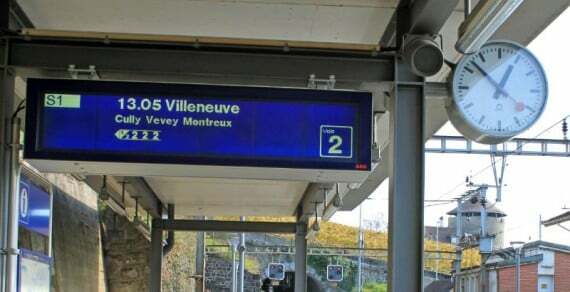 Train changes are always required – usually in Lausanne, but occasionally in Morges. Trains from Montreux to Zweisimmern via Gstaad (sometimes on the Golden Pass panorama trains). Rack railway to Rochers de Naye to enjoy the views or visit Santa Clause’s mountain top workshop. Montreux can also easily be reached by train from many European cities. 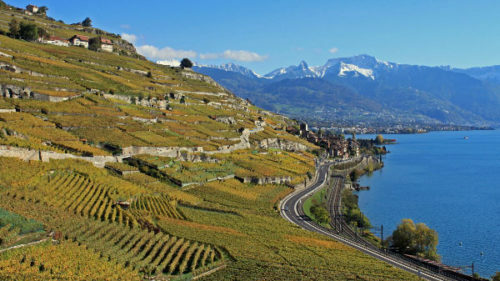 For train passengers arriving from France, Belgium, and London, the fast TGV Lyria trains from Paris to either Genève or Lausanne, both with excellent onward connections to Montreux, are particularly useful. Travelers from Italy should travel via Milan. Trains may be reserved through various outlets including French Railways English sites: RailEurope (USA / World) and Voyages SNCF (UK). Direct Euro-City train (EC) services connect Montreux with Milano up to four times per day in just less than three hours. One train per day continues past Milano all the way to Venice in six hours, while many further connections are available from Milan to the rest of Italy. 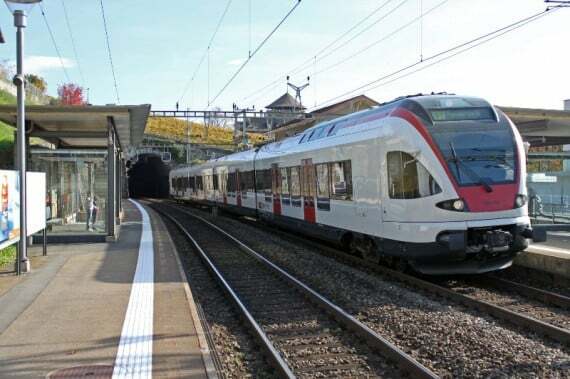 Around 14 connections per day to Montreux are available from Paris-Gare de Lyon with TGV Lyria trains via Genève-Cornavin taking around 4h30 and via Lausanne 4h06. Occasionally, TGV Lyria trains go all the way to Montreux (and up the Rhone Valley to Alpine resorts). Around ten daily connections are available from London-St Pancras with the Eurostar and transfer in Paris to the TGV Lyria trains for Switzerland. Total train traveling times from London to Montreux is around 8 hours, although faster than 7 hours is possible for travelers knowing their way around Paris train stations and metros. Around 12 connections per day are possible from Brussels to Montreux. Once again, most passengers have to transit from Paris-Gare du Nord to Paris-Gare de Lyon to reach Switzerland on the TGV Lyria service. The total train traveling times from Brussels to Montreux is just less than 7 hours. Trains from Frankfurt am Main to Montreux take around six hours. Changes are usually required in Basel. Book through German Railways. 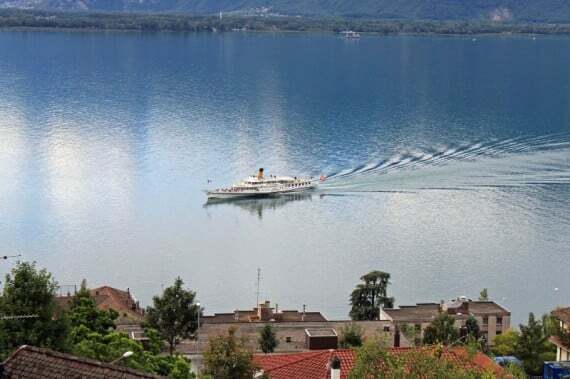 Boats, especially the Grand Epoch steam ships operated by CGN, provide the most romantic transportation to Montreux. Lake Geneva pleasure boats frequently call at Montreux. Even in winter, boats stop at Montreux although mostly on weekends only.